When Jamie first asked me which was my favorite gift box from our new Pre-Designed Collection, I immediately claimed ‘Bad Day Box’ as my favorite. But then I changed my mind the next day and one week later, the ‘Glitter & Gold’ stole my heart. My mind changed constantly! For today, I will break down my favorite gifts into different gifting occasions so this way, I don't have to choose just one. More to choose from, yes? Hands down, a gift I would gift myself is the 'Yes Way Rose'. I secretly believe Jamie made this box with me in mind! 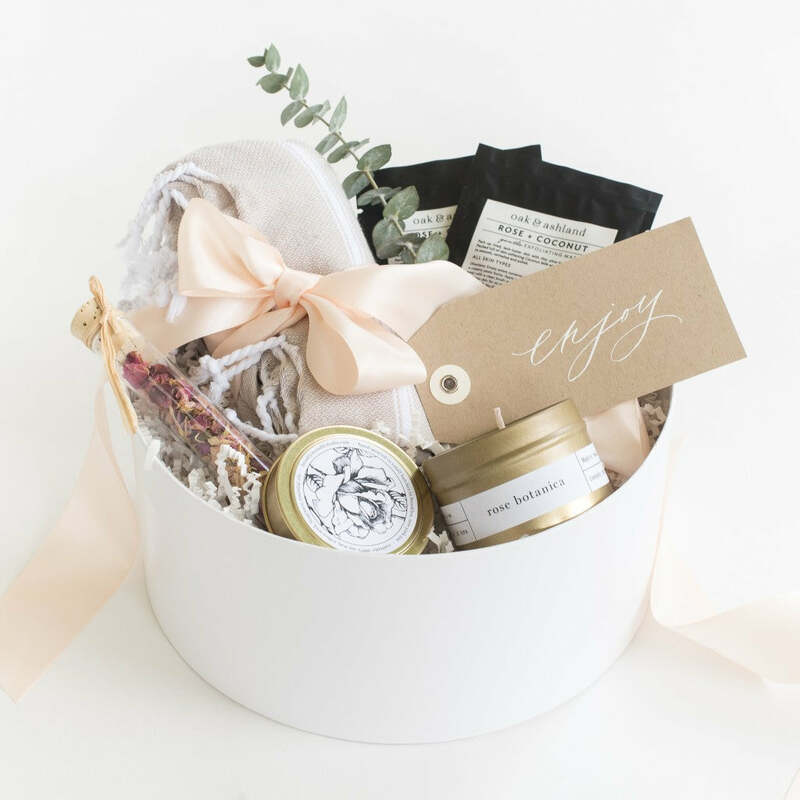 From a visual perspective, the gift is filled to the brim with pampering goodies. I LOVE how the black packaging of the masques pairs with the tan tea towel and the rose etching on the candle tin. It’s an overall, beautiful gift. It is not only just a pretty box though. The rose test tube and rose candle are useful keepsake items, a very important qualities amongst all of uur gifts...aesthetically appealing AND useful. Pulled together, it is the organic nature of the box that makes it so special and arguably, the most unique of all the gifts. My best friend would receive 'Dream Big'. My girlfriends are big visionaries. Give them a project and it’s done in a day! Give them a challenge; no biggie. 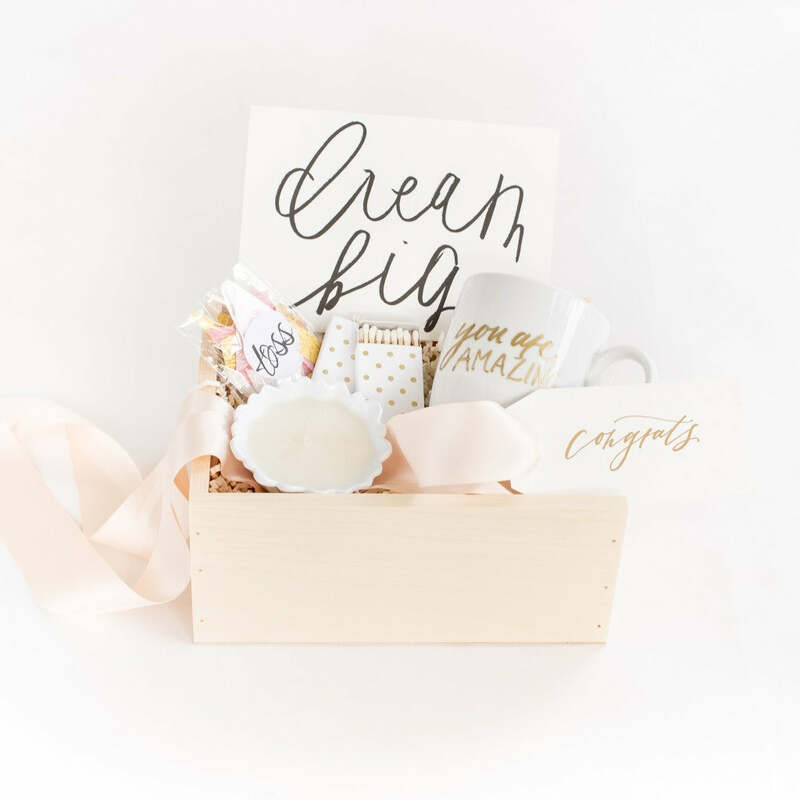 The theme of this box is to aim for those larger-than-life goals, and ultimately, to celebrate you for who you are. I'm particularly fond of this theme and could see all my girls throwing the confetti in the air just for fun or carefully framing the 'Dream Big' print in their offices. It's perfect for them! The decision for which gift to give to a client was hard. And it should be hard decision! When you are finished with your services with a client, it’s not a good-bye. It’s really a ‘thank you’. You want to tell a story of your relationship, of how thankful you are to the client for trusting and choosing YOU to write their story, whether it was planning their wedding or photographing it. 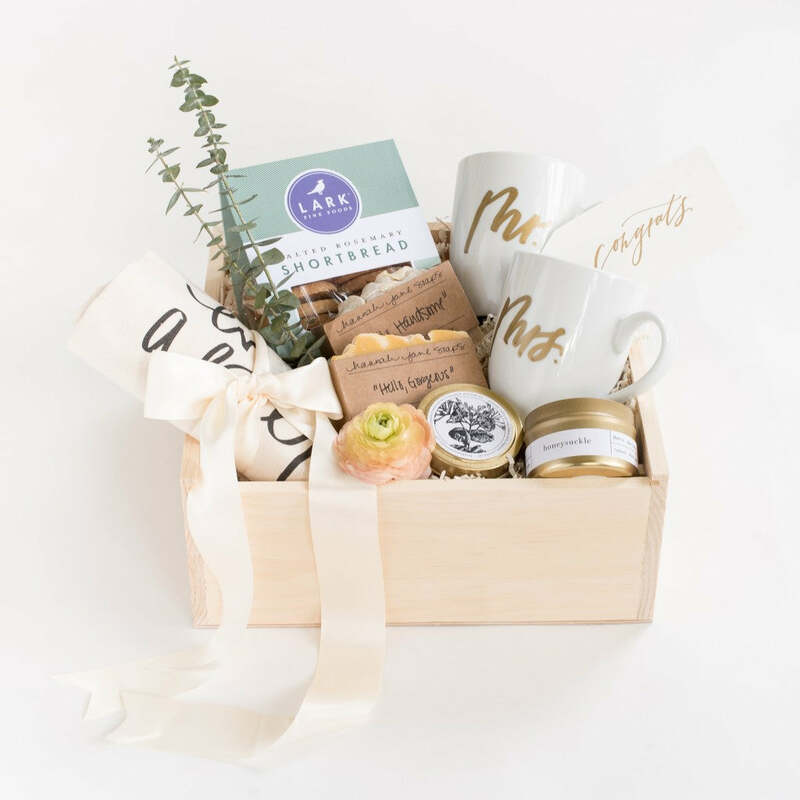 Their thank you gift must be presented well, must be on-brand, thoughtful, and overall, tie the loop between customer, service, and your business. So without further ado, I choose ‘Happily Ever After'. I love how the gift comes in a pine wooden box vessel, perfect as a keepsake item. Your client can re-use the pine box to hold their wedding invitations, or other special items from their wedding. ‘Happily Ever After’ is a packed gift, filled with thoughtful goodies, like cookies (so delicious! ), and wonderfully scented soaps. So there you have it! My favorite gifts for different occasions! The new line pulls in dashes of personality and versatility with a beautiful, approachable aesthetic. I love them all! 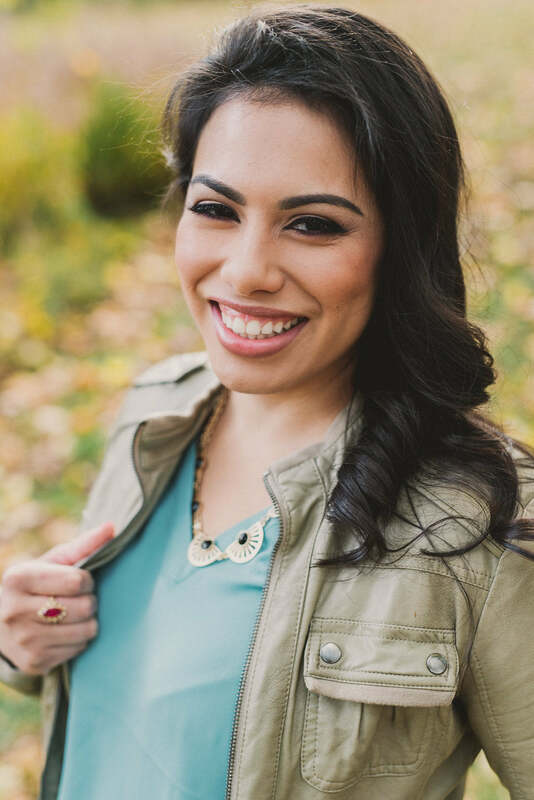 Katherine joined Marigold & Grey as Operations Manager and quickly became Director of Operations. She came from the world of academia, where she led communication, events, and development efforts. Katherine's love of weddings (including her own! ), combined with her expertise in operations and appreciation for creativity, drew her to Marigold & Grey. When Katherine is not snuggling her toddler son Lionel, she knits special garments and accessories, explores local vineyards, and enjoys yoga. A classic romantic, Katherine is an avid lover of literature. You can find her reading 'Wuthering Heights' and sipping her favorite red wine every winter.